Hiya Pet lovers......I need some help. My family has a cat named Blaze.....he'll be with us for a year in June. If he makes it that long here. When we got him as a kitten, he was easily trained to use the litter box. No accidents anywhere. In Feb of this year, he had a bout of diarrhea. We took him to the vet for a shot, and it seemed to be fine. However, as time goes on, the diarrhea is becomming more frequent, and he can't get to the litter box. We've taken him to the vet for tests, worms came back negative. The vet said it could be colitis. He gave us special food about a week ago. It hasn't helped, and the diarrhea is still here. Each morning is a sick treasure hunt of where he releaved himself. On Thursday he has an appointment for x-rays and bloodwork. Needless to say, this is getting expensive, and we are concerned for Blaze's health. Has anyone else had to deal with this issue? Any advice? 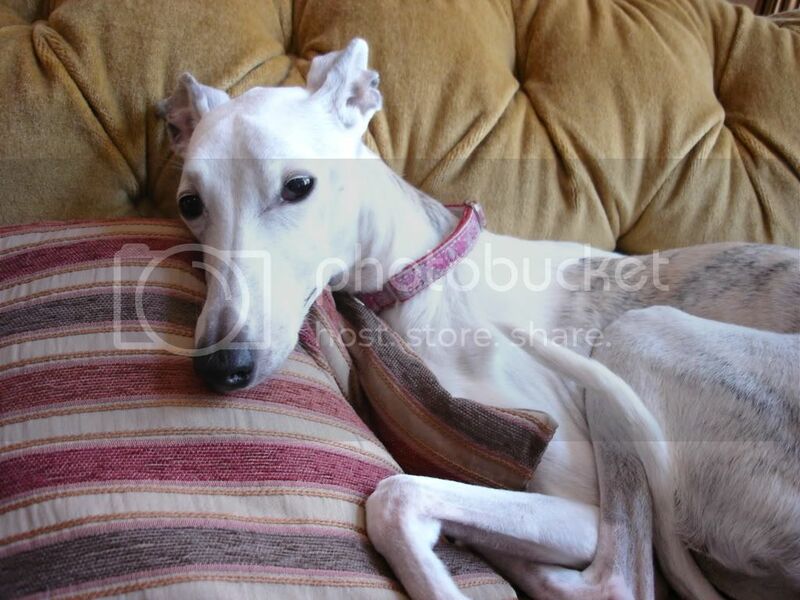 Chuck, my now-12-year-old whippet Madison was diagnosed with Irritable Bowel Disease about three years ago. While it's different than IBS, I think there are many similarities. BTW, Madison was diagnosed without an endoscopy (after we had spent a small fortune on X rays and other tests, including an MRI of her brain -- but that's a whole other story). I think you'll be able to get Blaze's IBS under control with some dietary changes. Right now Madison's food is Hill's Prescription Diet z/d Ultra canine. (They also make a feline version, I see.) It's a highly digestible food which is allergen-free. It's the only food that Madison is allowed to eat except for the little bit of American cheese we wrap her pills in (or use to entice her to eat her food). If she accidentally eats table food, we pay the price because it brings on diarrhea and we have to start up the prednisone regimen again. With dogs anyway, prednisone causes increased urination, but maybe that's not as big a deal for cats since they always have access to a litter box. I found the Internet a great resource when Madison was first diagnosed. I even joined a Yahoo group for dogs with digestive issues. Maybe you can find one for cats. I regret that Madison wasn't diagnosed earlier because she had always seemed to have a sensitive stomach and frequent bouts of diarrhea. Thanks for the reply, Fran. The vet now seems to think it's IBS instead of colitis. He said some of the symptons for colitis were missing. 5 days with no accidents. Nope....it's been an additional 11 days, and no more accidents. My kitty cat, and my mum's new(ish) pup, Lundie and my sisters 'pup' who is just over a year old, Bracken. Both are Jack Russels. Lundie, Bracken, and the kitty are very cute! Do they all three get along? Are the dogs related? What is your cat's name, Kelda? My cat is called Skimble..... as in Skimbleshanks the Railway Cat from Cats! And no.. they don't get on! The cat hid for the whole week we were looking after them! Or glared at them from the top of the stairs! Bracken chased after him when he saw him, and almost gave the cat a heart attack! Had it just been Lundie I think they may have got on by the end of the week.. as she's no where near as hyper as Bracken!! The doggies aint related but they look it dont they!?! The wee one has a smooth coat though - the big one has a more rough coat.